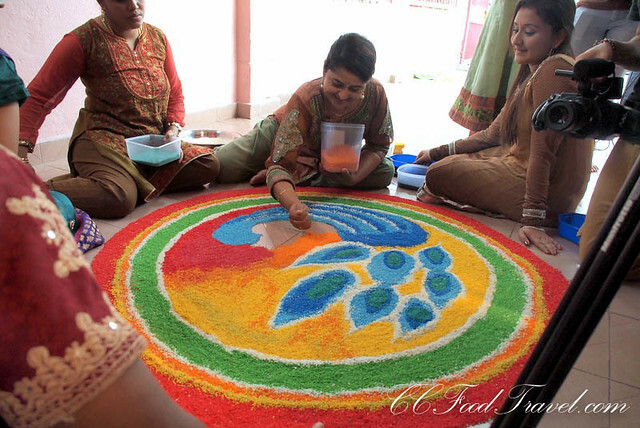 On the Eve of Deepavali people decorate their houses and workplaces and make traditional Kolam ‘Rangoli’ motifs on the entrance, to welcome Goddess Lakshmi. Lamps and candles are lit throughout the night. 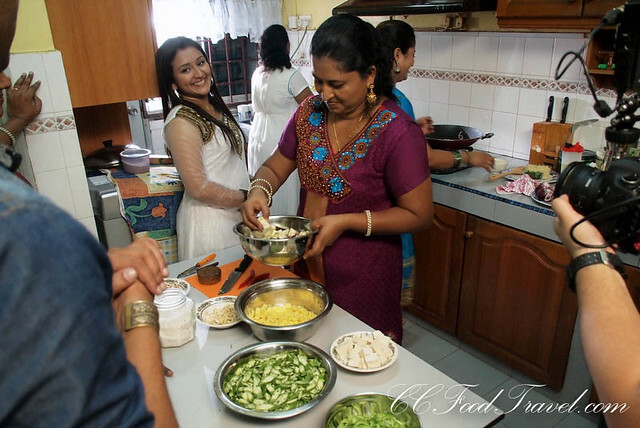 This leg of the journey, on the Petronas Deepavali Webisodes, brings us to a house in Seremban, the lovely home of Helen aka Saresvathy Raman and family. I have long marveled at the beauty of Kolam and the art of Kolam drawing. And before today, it used to be just another form of art to me. Little did I know, that there’s so much more to Kolam, that’s drawn on the eve of Deepavali, than meets the eye. 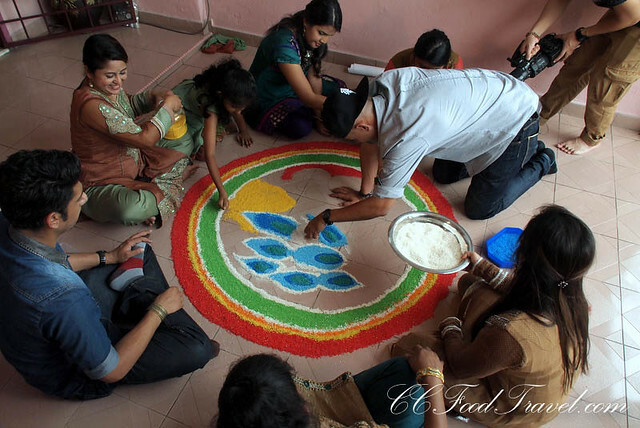 You see, Kolam has a dual function – both religious and ornamental. 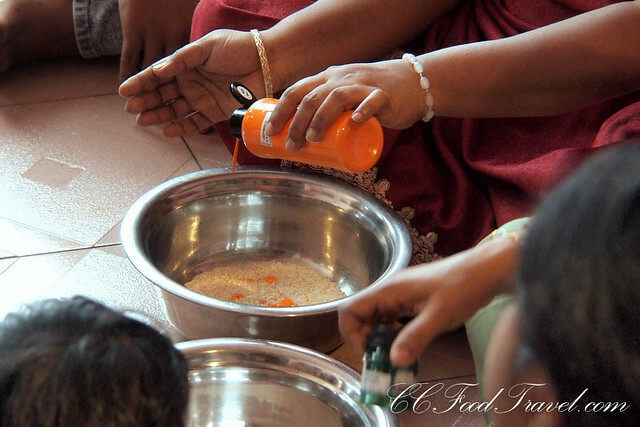 In Hindu philosophy, the principle of dharma states that one should be of service to all, humans and animals alike. Traditionally, various motifs were drawn on the floor to feed insects with the design made out of white rice or edible grains. 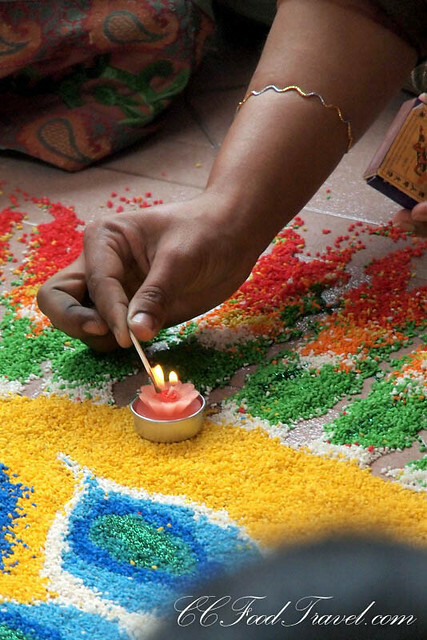 Slowly it morphed, and dyes from vegetable colourings were used to beautify and add color to the Kolam. This is known as Rangoli. Anyway, be it in white or in color, this act of charity has been recommended in Hindu scriptures since as far back as the pre-Aryan period. One should start the day off by feeding the animals and insects before even going about one’s daily activities. Hinduism states to give away everything you want, and you will be blessed with more. 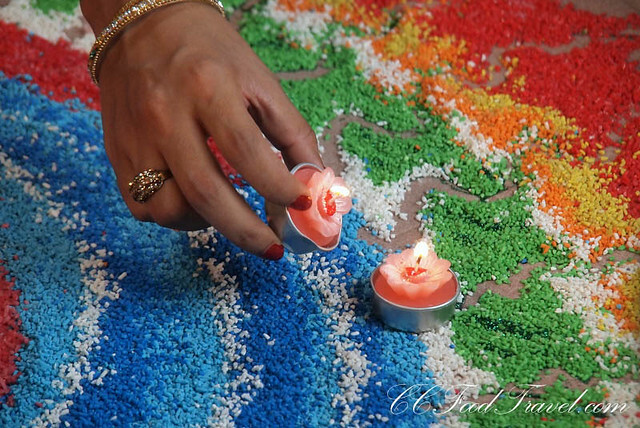 The Kolam is also drawn to welcome Laksmi, the Goddess of Prosperity into the home. Its secondary purpose is to add aesthetic value to the Hindu home. We got a chance to speak with Helen aka Saresvathy Raman as well as Mr Kandasamy Velayuthan, colleague of Helen & chairman of Malaysia Hindu Sangam (state council), Deputy chairman for Malaysia National council, to tell us more about the Deepavali celebrations and preparations that occur in their household. On the Eve of Deepavali, the Kolam design is picked out and decided upon by the family members. 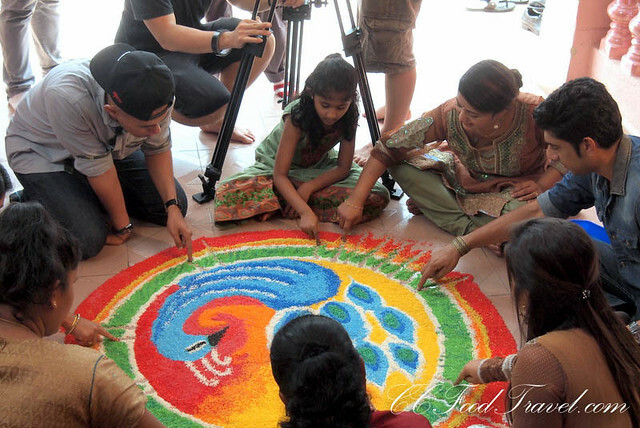 Then, they design the Kolam and it is usually based on a symbol that depicts an auspicious animal, for example, the peacock. 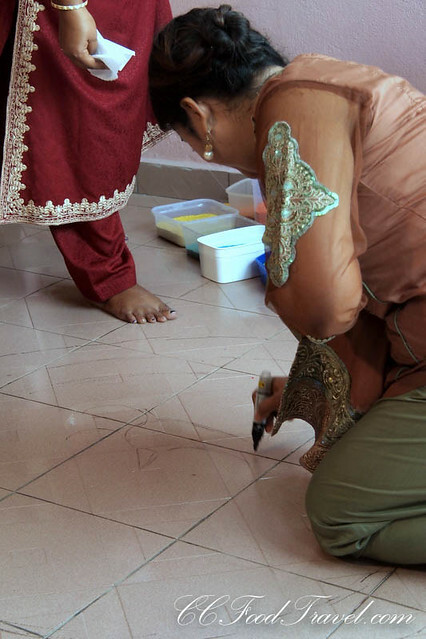 Helen tells us that she does the initial sketching of the Kolam design with the children. 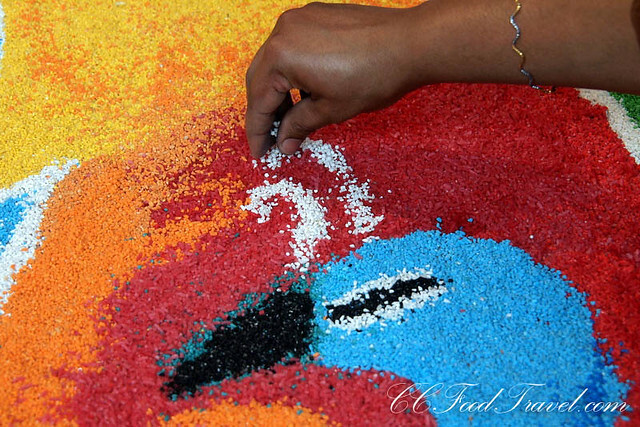 They draw the design with chalk and then proceed to fill in the design with colored rice, red beans, peas and desiccated coconut. 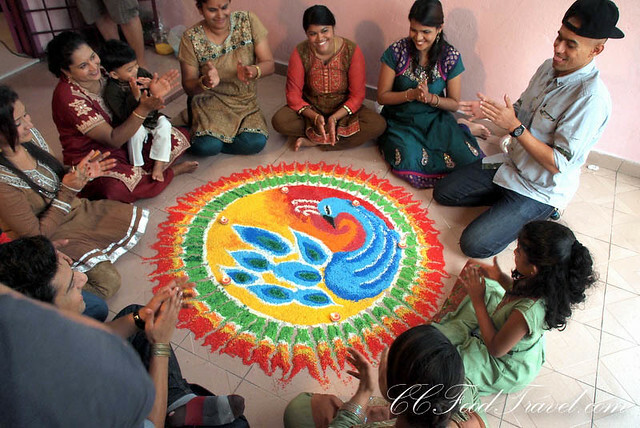 This is Rangoli Kolam. 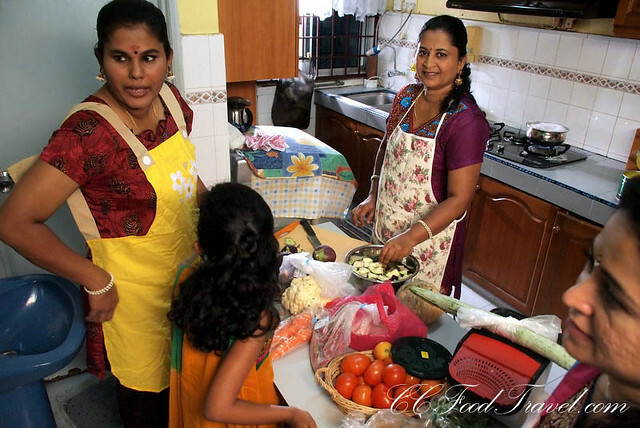 On the night, eve of Deepavali, the family gathers to eat together. Before eating, they practice ancestor worship and offer prayers to the ancestors. Dinner is strictly vegetarian and the family usually eats a light meal of Chapati, Thosai, Dhal, vegetables and chutney. That Night, the home is lit up in colorful lights. Traditionally earthen oil lamps were used, but now city folks just use light bulbs. Speaking to Aanantha and Altimet at the Seremban house, they told us that it was such an eye opener to see how a family celebrates Deepavali, and the Family spirit and togetherness that goes into the designing and making of Kolam. They felt that a lot of lost rituals should be revived and practiced in modern families, too, so that the rich culture of Deepavali is not lost. Altimet joins in the fun.. Kolam designing was never this meaningful! 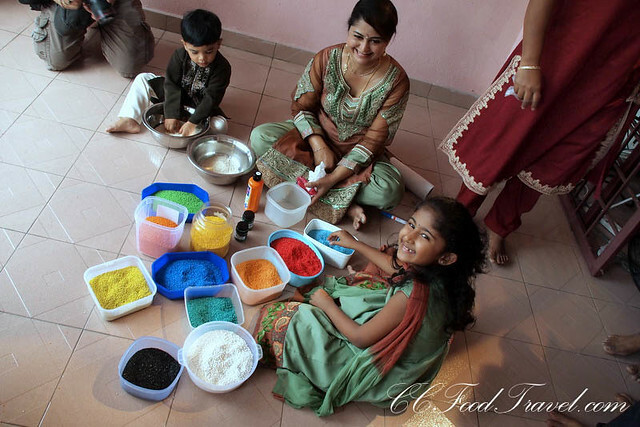 The final product… a Rangoli Kolam – the entire family, guests and friends, have had a part to play in making the Kolam come to life! Next articleFour Points by Sheraton Penang.. a lovely place to stay! Webisodes are trending and getting real popular and this one has got so much story to tell. I think they did a great job. Yes indeed! Very well shot and with a moving script. 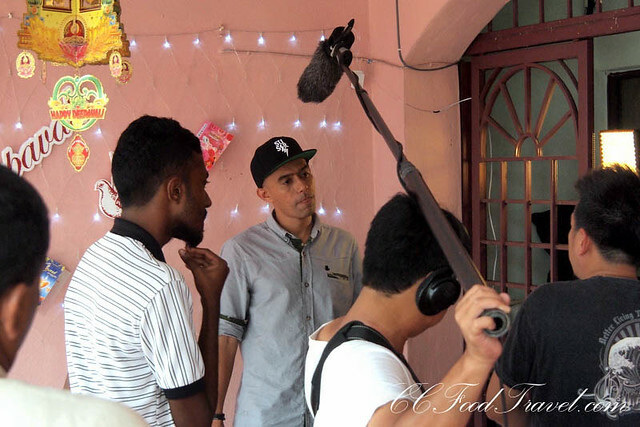 These webisodes really contribute back to society and help keep the spirit of Deepavali alive in our country. Nice! I like how you’re there to witness how it was filmed. I learned some of the customs from your post too. To be honest, I only have a handful of Indian friends and they’re not the devout type, if you catch my drift (the kind where you know more about their culture than they do haha). It’s interesting to see all these customs explained properly. Yes I agree.. it was an eye opener for me too! Kind of like how many chinese traditions go SWOOSH over my head as well.. Anyway, more delightful info and visuals to come on the Webisodes.. stay tuned! What a stunning kaleidoscope of color! Yes indeed! Deepavali is really colorful and it is the celebration of light! Love the culture and the food too.. so interesting and vibrant – never a dull moment!